The graph shows the beer prices at NFL stadiums (teams) according to the price of a beer purchased at a concession stand in the stadium. A small draft beer sells for 9.00 U.S. dollars at Dallas Cowboys games in the 2018 season. The National Football League is the number one sports league in the United States. In 2013, total league wide revenue was at more than 9.5 billion U.S. dollars, while the revenue of Major League Baseball was at about 7.1 billion U.S. dollars. The average per game attendance at NFL games, which was at 68,400 in 2013, is more than twice as high as at MLB games and more than 3.5 times higher than in the other team sports leagues in the U.S. (NHL, NBA & MLS). For the 2014 football season the average ticket price for National Football League games was at more than 84 U.S. dollars. The average ticket price has steadily risen over the past few years from about 62 U.S. dollars in 2006 to around 76.5 U.S. dollars in 2010 and to 84.43 U.S. dollars in 2014. Compared to the other major sports leagues in North America, tickets to NFL games are the most expensive. Tickets to NHL games sold for an average of 61.60 U.S. dollars (2013/14 season), tickets for NBA games (2013/14 season) for about 52.50 U.S. dollars and game tickets in Major League Baseball (2014) had an average price of about 28 U.S. dollars. In 2014, tickets to games of the New England Patriots were the most expensive based on the average ticket price with 122 U.S. dollars according to the NFL Fan Cost Index of Team Marketing Report. 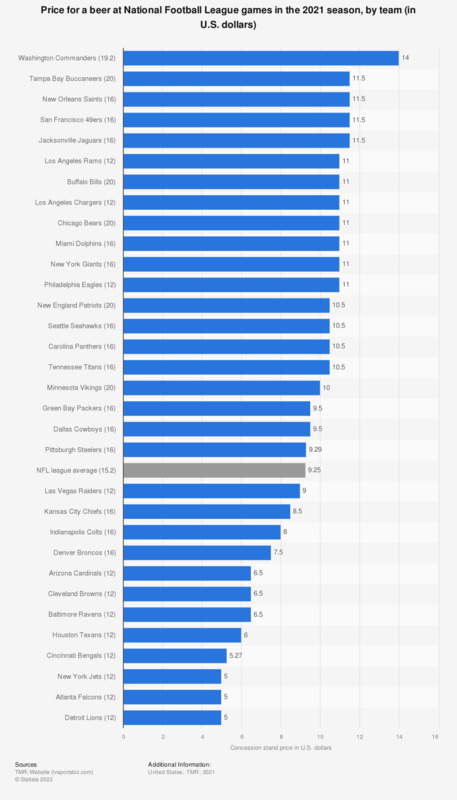 The Cleveland Browns had the least expensive tickets with an average of 54.2 U.S. dollars charged per ticket. At the NFL stadium concession stands a small beer sells for an average of about 7.50 U.S. dollars in 2014. A small soft drink costs about 4.70 U.S. dollars on average and about 5.40 U.S. dollars are charged for a hot dog. Which of the following football shows have you watched in the past 12 months?